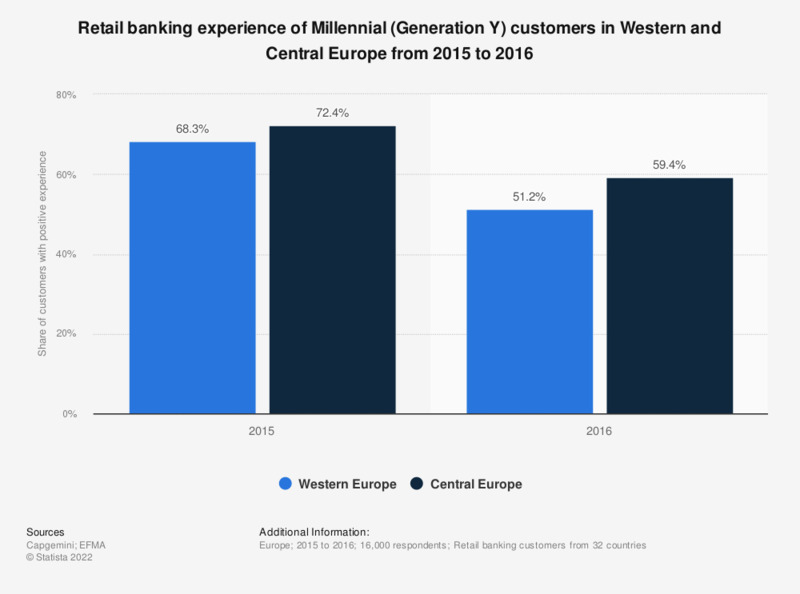 This statistic illustrates the share of satisfied retail banking customers (customers with a positive experience) of the Millenial (Generation Y) customers in Western and Central Europe from 2015 to 2016. In the cases of both Western and Central European countries, Millenials reported lower levels of satisfaction in 2016 than in the previous year. Millenial satisfaction was slightly higher in Central Europe: 51.2 percent of Western European and 59.4 percent of Central European Generation Y customers were satisfied with their retail banking experience as of 2016. Generation Y also known as Millenials: this term usually applies to people, who reached adulthood around the turn of the 21st century: individuals born anywhere between early/late 80ties and early/late 90ties. Everything On "Millennials financial management habits in the UK" in One Document: Edited and Divided into Handy Chapters. Including Detailed References.